Buy a meal sampler fit for a king. The Royal Special. Two delicious dinners, two magnificent gourmet tastes. Our Prime Rib Dinner featuring premium cuts of prime rib roast begins this meal fit for a king everyone. 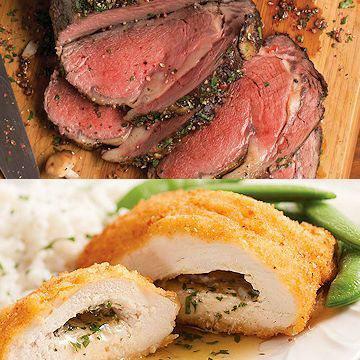 Add to that our Elegant Chicken Cordon Bleu, and you have dinners that are perfect for absolutely any occasion! Meal serves up to 8.